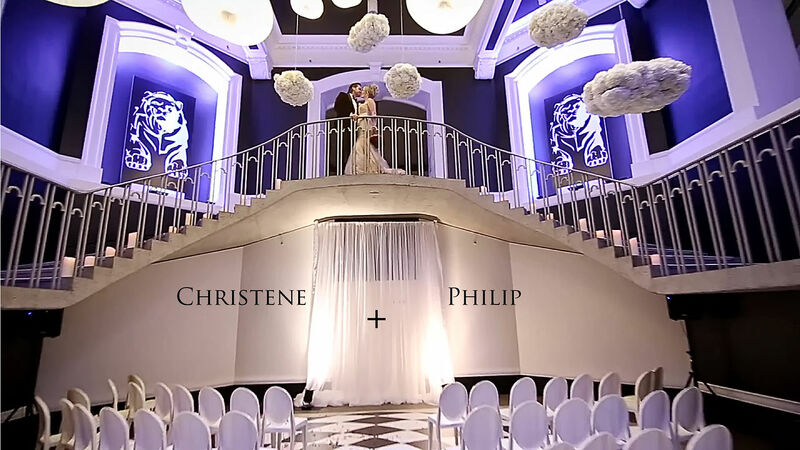 Wedding Cinematography Christene and Philip Same Day Edit Video – Intimate Splendour Wedding – Vancouver Wedding Videographer Life Studios Inc.
Christene and Philip’s Wedding is BEYOND EPIC! They’re a couple that knows how to value and treasure relationships. It was an honour to have been a part of their wedding and be able to tell their beautiful story of how they love each other and their care for their loved ones, all captured and told through their Wedding Cinematography Christene and Philip Same Day Edit Video! The uniqueness of this wedding is definitely one of our favorites. It was an INTIMATE SPLENDOR. It was a wedding of 50 guests, in some of Vancouver’s most prestigious locations. Their invitations said “ See you at Hotel Georgia” where everybody arrived both dressed in Black or White and had their cocktails. Nobody knew where the ceremony would take place until Philip led everyone to the Vancouver Art Gallery. Indeed a Wonderful Surprise! The Vancouver Art Gallery was transformed into a unique luxurious piece of art. The grand staircase, the exquisitely designed flowers and décor, and the black and white mosaic floor welcomed the guests. The excellent lighting, the lion emblems and the lovely music made the ceremony ambiance beyond perfect. Christene looked Absolutely Stunning! Sonia from TheyRep did Christene’s beautiful hair and make up. It was such a joy filled moment when she got into her luxurious Vera Wang wedding gown matched with custom made elegant jewels by Elsa Corsi. Philip looked devilishly handsome in his striking Jp Tilford Samuelsohn Tux for Harry Rosen, which was designed just for him! The ceremony was followed by an extravagant communal style reception at The Vancouver Art Gallery with arrangements of silver flower vases topped with delicate ivory flowers and accented with crystal candle holders matching the chandeliers. Paying attention to detail at it’s best! Each chair was custom-made with the lion emblem exclusive for Christene and Philip. The Urban Style dancing and party continued at the top floor of the building where everybody had fun. One of our favorite parts is how the couple honored their guests. Christene and Philip wrote something special about their guest and attached each individual Polaroid photo in the frame together with the sweet words from the couple and gave it to them as a wedding favor. The beautiful couple, their lovely guests and the collaborative effort of all the vendors really made their wedding day smooth, relaxed, stunning and most of all fun. This might just be The Wedding of the Year! The planning was superb; We really admire how Erin Bishop from Filosophi Events pulled it all together. The flowers and décor by Evan Orion from Flower-Z and Lounge Works were over the top spectacular. We are grateful to all the other crews that we worked with (Vancouver Art Gallery, Hotel Georgia, Aerocar, Leanne Pedersen, Sonia of Theyrep and Savory City). It was such a joy working with you all! Cheers to Christene and Philip! It was truly a wedding to remember! Be wowed and taken to a world of intimate splendor in this Wedding Cinematography Christene and Philip Same Day Edit Video!